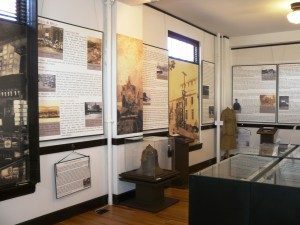 The Cherokee County Historical Society was founded in 1975 by dedicated volunteers who were willing to work to preserve more than 86,000 documents, books, photographs and historical artifacts from the surrounding area. Those items are now in the Cherokee County History Museum. The museum, based in Canton, fulfills that vision and looks to teaching future generations about the past. The museum cleverly blends the old with the new through permanent and temporary exhibits. Many of them can be explored by using interactive iPad presentations. Cherokee County Historical Society is dedicated to historic preservation for your edification and enjoyment. They off insightful temporary exhibits that change several times annually. The Museum also features several short videos about real Cherokee County citizens who have a story to tell. The Historical Society received an Archival Excellence Award from the Georgia Archives for this exhibit. Here’s the address for the Cherokee County History Museum: 100 North Street, Suite 140, Canton, GA, 30114. Wednesday – Friday from 10:00 a.m. – 5:00 p.m. Admission is free for you and your family.